The Sichuan Gymnasium was filled with cheers for Zhang Jike in yesterday's proceedings of the 2016 ITTF World Tour SheSays China Open. However, it was really not for the Grand Slam champion. 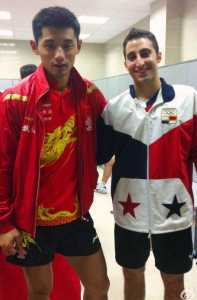 It was for the Panamanian player Omer Avi-Tal who is a big fan of Zhang Jike. His journey in Chengdu might be short but he is full of aspirations. While the seeded players of the hosting team were still off from the competition yesterday in the 2016 ITTF World Tour SheSays China Open, fans were already gathered to cheer for Zhang Jike. But the Grand Slam champion was not on duty yesterday. Who could be the Zhang Jike these fans were cheering for? It turned out that it was the young player from Panama, Omer Avi-Tal. Yesterday, he and his partner from Guatemala, Kevin Soto battled against the Malaysian tandem of Javen Choong and Leong Chee Feng in the Men’s Doubles round 16. It was a difficult match for the transnational pairing. After four games, Avi-Tal and Soto were eliminated. Although it was a defeat, the support of the fans still made Avi-Tal feel better. “I heard everyone cheering for me. I am extremely grateful for them,” Avi-Tal said. So how did this young player from Panama became Zhang Jike? The 21-year old admitted that it is because of his love for the Table Tennis sport. By the age of 15, he already knew that he and the sport will be inseparable. With that burning passion, Omer Avi-Tal was brought to China to study and at the same time enhance his skills in table tennis. During his stay in China, Avi-Tal discovered Zhang Jike and started to become the number one fan of the Grand Slam champion. He named himself as Zhang Jike and his teammates are also game to call him in such name. Omer Avi-Tal has some expectations for this week’s China Open. First is to meet his idol in person. Second is to create an upset and defeat the Japanese seed Koki Niwa in the opening round of the Men’s Singles. In this way, it will give him a chance to battle against his idol in the next round. Unfortunately, this afternoon, his second goal was not attained. He was defeated in 1-4. Hopefully, he was able to achieve his other goal. Avi-Tal’s journey in Chengdu this time was cut a little short but this guy is full of aspirations. He revealed that there is a possibility for him to play in the European League under Spain or France. Ultimately, he aims to participate in the next Olympic games. “Right now, my level improved a lot. My goal is to be in the world’s top 100 and then participate in the Tokyo Olympic Games,” Omer Avi-tal concluded.